Black Mirror started its life as a three-part series on Channel 4, and by the time its second season hit screens it had attracted a cult following in the UK. Its one-off episodes provided a unique formula of real-life dilemmas and emotions brought on by the abuse of powerful technology that left audiences questioning their moral standpoints. In 2015, after two series and one feature-length episode on Channel 4, Netflix commissioned 12 new episodes, allowing it to go big budget with epic short films and massive global audiences to match. Some viewers worried about its new American influence, but the online giant's first season last year provided the same level of sinister, just with a bit more production and polish. 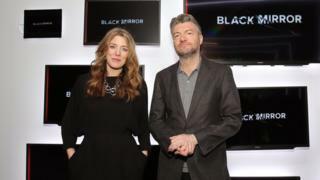 Ahead of Black Mirror's second Netflix series, we sat down with show creators Charlie Brooker and Annabel Jones. Netflix were very explicit about what we could talk about when they invited us to interview Brooker and Jones, who are Black Mirror's creative directors, screenwriters and producers. Spoilers were the hot topic - mostly how I couldn't reveal them at any cost (having been given two episodes of the new series to watch). So when asked what we expect in this series, Brooker said: "You'll have to wait and see. "I can tell you we have a wide variety of tones and almost different genre pieces. "We've got a space epic, a brutal survival horror, a tech noir thriller, we've got almost a rom-com - well as close as Black Mirror gets to that - and we also have a tree house of horror style sort of three-stories-in-one episode and we've got an indie movie with a mother and daughter relationship." Jones adds: "Yeah, an American indie drama directed by Jodie Foster." The Black Mirror Twitter account has posted a teaser for every episode so far but each has given very little away. One of the teasers which caught the millennial eye was the Hang the DJ clip, which appeared to show a futuristic version of Tinder. "It's fair to say it's about a system and a service," is Brooker's only clue. "It's probably one of our lighter episodes because we're varying the tone more throughout the season, partly to keep the show interesting for the viewer and unpredictable and for ourselves." Jones interjects: "It's a film about dating that couldn't have been made 10 years ago, as in a sense it is reflective of the world of dating. "It is lighter but there's also a few moments of sadness and melancholy, there's a lot of funny and wry observations but it feels very relevant." Brooker adds: "That doesn't mean we're short-changing on the nihilistic bleakness, there's plenty of that around," with the grin of a man who knows how many people are going to have nightmares after watching this series. One episode of Black Mirror that struck a chord with the younger generation was Nosedive, which shows what life is like when an Instagram-style app rules every aspect of your life, so I ask Brooker and Jones what they think about social media. "I'm very grateful that it didn't exist when I was a teenager," Brooker says. "I don't know how at an age when you're trying to put your identity together, how you cope with the pressure of a performance space, which is what social media is. "The level of judgement that goes on there, just the pressure of it - I can't begin to imagine what that is like for someone today." Jones has a different idea: "I think maybe people have different skills to what we did growing up, so I think as long as you understand the pressures you're under and you put it within a perspective it's fine. "I think it's a great time for technology if used and embraced in the right way and with a positive attitude - if you take the good bits then you're going to have a good time!" "In our stories technology is never the villain"
Jones's extremely positive outlook seems strange for someone who has created a show with human suffering from technology at its core. Brooker is quick to apportion blame to people not things, saying: "In our stories technology is never the villain. "It's about giving an individual great power but if that individual is weak or has a flaw that's where the problem comes in, it's not generally inherent in the technology itself." Brooker adds he "grew up loving computers" but says the problem we have today is learning how to use the devices around us in the right way. "People often say that the show is pessimistic about technology but we're generally more optimistic about it than maybe the show puts across because the programme is extrapolation and invention - taking a fun idea and then taking it to its dark and often horrible logical conclusion," he says. "We have [shown technology positively] in San Junipero from season three, without wanting to spoil that for people who haven't seen it. "Consciously that was an optimistic story with technology at it's core that was enabling people to do something amazing and there's a couple of stories this time around like that." Jones adds: "I think for the stories to feel authentic and credible it's got to be a technology that you'll allow into your life, that is giving you something and enabling you, but as Charlie says there's always potential abuse in that." Black Mirror Season Four is available to stream on Netflix on 29 December.